Who or what is K and B? Watches over us on guard. Bob was lonely, but after a few months he has adjusted to being a one-dog family dog. He continued to mature and become a wonderful companion. Love to play with his toys, chase Tom around the house and yard, and climb on the bed with Tom and Jane. But he still needs lots of attention. As with all things, it soon ,was Bob's time. Unlike Katie going from old age, Bob suffered with cancer for a short time. 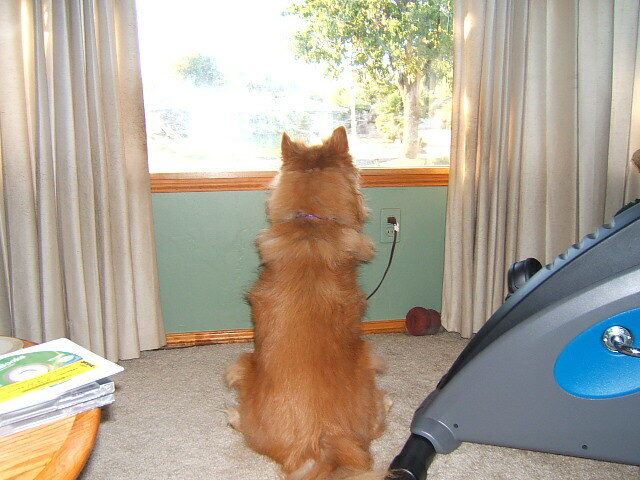 Then, on August 10, 2009, as we were preparing to take him to Cambria one last time, he couldn't get up. It was time. Our friend, our baby, was gone. We have been blessed with wonderful companions over the years: Dingo, Rimfire, Katie, and Bob. We now have two rescue pups, Emma and Sam...they are handfuls, but they are our friends, our companions, our babies.